I KNEW YOU WERE JOKING! why dun you try changing browsers? i recommend Firefox and Safari. we should be friendly to each other! i suggest..anO..if it's kay for all..
if we change our banners..
shOULd we change our forum layouts?.. ..sO that new banner and new layout..hehe..
you mean colour scheme or something? maybe bibi would like to change it as she likes. for example, black would be an angry bibi. green would be a jealous bibi. yellow would be a DIRTY bibi. haha. ooh you changed a bit of the layout! but im having a bit of problems. not problems actually, but well, the imeem yume no tochuu keeps replaying itself whenever i click on a new tab thing. and that particular imeem box is actually eating into the actual screen. heh but i think this is not to worry, cuz i know bibi will fix this. maa..do u thnk it's okay to put those small mini boxes<left handside there..
hmm, personally i would prefer them not to be there. haha! since those are stuff from the 'Portal' right? yupp, this way i can view the index in fuller view! the forum appearance is good *thumbs up* but i think it would look better with a picture of WaT in the background (where the swirly thing is) and a chatbox/cbox thingo so the members can chat easily like talk about things in general or just a hello great job on the site!! ahihi..tnx for the suggestion.ahh~I purposely remove the chatbox LOL. hai..i also love to have a chatbOx..^__^..
yeah..that's kaay biha..gambatte to your exam nee~..
i've got notice at pic and scan's room..
it's getting many topics posted in their..
what if..ano..would you allow if we fix it?.. well pOst 3 types of pic post..
so that the topic wont mess..
so..when they post te-chan's pic..they'll just put it in "teppei" topic..
and if anyone wants to post another te-chan pic..they'll just post it again in the same topic post..
same as in another topic..well just then continue posting at the same topic..
im not good at explaining biha..
i hope you understand what i mean..hoo..gomen..
so its like a post with all the teppeis, and a post with all the wentzs, and a post with all the WaTs. hai2.I'l put u as a temp. mod in pic and scans section. 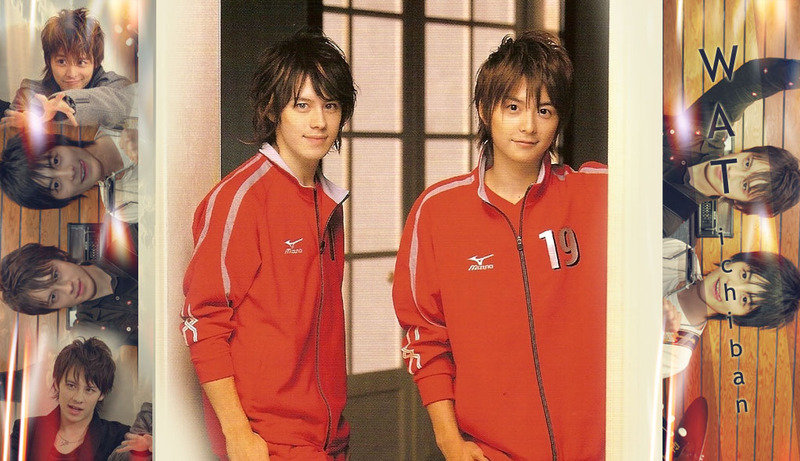 i hOpe i cOuldnt make trOublesOme..
..anO..about the icoNS..can we change it into teppe and eiji pix?.. why dun we change the icons into techan n eichan pics?? thnkz so much 4 ur hard work..bihachan..